At 3717.91 metres (12198 ft)the volcano Teide (Tay-dee) on the island of Tenerife (Tenner-reef-ay) forms the highest peak on Spanish territory and the worlds third largest volcano (Last eruption 1909). 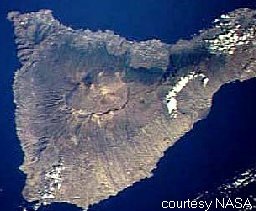 The older extinct crater it stands in can be seen as a rough circle at the centre of Tenerife in the NASA image. Teide is the cone at the north (top) edge of the rim. The two calderas are designated as a national park and access to the summit cone is strictly controlled. Without a summit permit (free) walkers are only allowed as far as the two miradors (viewpoints) and their connecting path (shown in red on sketch map) which contour the base of the final summit cone at the top of the teleferico (cable car). This restriction is essential because of the potential erosion and disturbance that would be caused by cablecar tourists going to the summit (the National Park has 2.5m visitors a year). The National Park are taking all precautions to protect the natural environment of the park, for example all the 4x4 tracks in the park are now closed to non official traffic. There are also rumours that the teleferico will be closed when its operating license expires. Large numbers of coach bourne tourists enter the park each day but concentrate at the teleferico, Los Roques and a patch of pleasant pumice convenient for coach parking. Once 50 metres from these three sites you will enjoy reasonable solitude. If staying at the Parador I suggest starting the Los Roques walk at dawn for dramatic lighting and solitude (walk in an anticlockwise direction, you may see Barbary Partridges and great grey shrikes here), returning for a late breakfast (until 11.a.m).Guajara (gwar-har-ah) and the other summits of the old crater rim may also be climbed from the Parador. Another highlight of a stay at the Parador is the night sky, unsullied by light pollution, groups regularly visit for dinner, an astronomical talk and night stroll. For the ultimate night sky/sunrise experience arrange to stay a night in the ICONA refugio Altavista near the summit. The path is well within the capacity of any British hillwalker without any scrambling being involved. It will be of interest to any walker who does not normally go this high, enjoys excellent views, or is interested in the novel experience, for the British walker, of climbing on a volcano. The only difficulties are lack of oxygen( 50% of sea level value at summit) and summer heat. Persons with a heart condition or who are pregnant should not attempt the climb. Long trousers, water, a fleece and lightweight waterproof jacket should be carried. In winter the usual additional equipment is required including glacier glasses to avoid snow blindness. (The angle of ascent is on average 7 and at maximum 12%). If climbing Teide in hot weather I recommend being on the hill before dawn, to avoid being caught by the sun low down on the mountain. This approach gives the bonus of watching the sun rise over the national park. (The start of the track is easy to follow by head torch.) Allow 5 hours (one way). Total ascent by this route is 1418 metres (4652 ft), not much more than Ben Nevis! In the summer months this will be a hot walk, during the winter snow is likely, in February dawn temperature at the base of the mountain was -1C and 5C at the summit at noon. The path starts as a jeep track (closed to public) to the east of a prominent mirador. Signs and a large map mark the start. Keep to the track on an easy gradient, zig-zagging up past the "eggs of Teide" (large black rocks hurled from the volcano mouth) until signs indicate the start of the footpath which now leaves the pumice slopes and ascends the edge of a lava flow until being eventually forced onto the lava itself. Once on the lava you will be glad of the well engineered path across the uneven surface . Keep climbing up past the refuge on its left (west) side until you meet the mirador path just below the summit . (Between the refugio and the mirador you can take a detour to an old commercial ice cave in use until 1900). Turn left onto the mirador path. Now may be the time to put your head down and get through the tourists getting in the way. When you reach the teleferico top station in a few minutes you will see the summit path on your right just before the building, the start guarded by a rope and a large, stern ranger. Once your permit and passport have been inspected you will be allowed onto the 'Telesforo Bravo' path to the summit. The path climbs steeply up the summit cone of yellow rocks ending on the lip of the crater. You may continue on from here anti-clockwise round the crater, stepping over small fumeroles venting scalding sulphourous vapours, to about half way where a length of rope indicates the section of the summit being preserved from all erosion . The views in all direction are spectacular, Tenerife's famous cloud seas (a near permenent inversion aloft caused by the NE Trade winds " Los Vientos Alisios") are now as much as 2000 metres below you and the Parador and El Roques look insignificant in the outer crater. If haze is low you will be able to see the other Canary islands rising up out of the clouds. When you have had enough of the views and retrace your steps to the teleferico, the guard will return your permit as a souvenier and you have the choice of walking back down or taking the cablecar (8 minutes - 20€ return) The cablecar is a good option if the day is becoming hot but bear in mind you must take care in returning to your car along the road. Do not become trapped between the retaining wall and passing vehicles. On your return the Parador cafeteria has draught Dorada and a telescope on the terrace to admire your climb. Park in the underground carpark by the Plaza España (plarth-ah esp-an-ya)(an impressive pedestrianised square with the town hall on one side) on the seafront. Calle Emillio Calzadilla (ky-ay em-ey-e-oh kalth-ah-de-ah) runs at right angles to the coast road to the east of the Plaza España. The office is on the fourth floor of number 5 (press entryphone and enter). English usually spoken. If office has moved enquire at the town hall nearby. You must present your passports here AND on the mountain. You will also need a photocopy of the "leaders" passport which is easier to obtain before you arrive. You will be allocated two days on which to make an ascent (in August and February the following two days were available) and must specify a summit slot of two hours (allow 5 hours for climb). Only one ascent on one of the two days may be made, but you may of course abort an ascent at any time before the summit checkpoint. Late/early arrivals at the summit checkpoint will be treated sympathetically at the discretion of the ranger. Maximum party size 10. The system has now become well known (and therefore due for change?) and there was a short queue at the office. The assumption was made by staff that we intended to use the telefericio and that if it was not running on our day we could use our permit on the following day. "Hola, Buenos dias. Por favor, quisiera un permiso por la cumbre del Teide para [uno, dos, tres] personas." oh-la bwen-oss de-as. paw fav-oor, kee-see-air-a oon perm-esoh poor lah coombe-brey del Tay-dee para [oon-oh, dos, tress] per-son-as.